Recently thinking about the core technology for a gravity balloon habitat (the friction buffers in my prior terminology), I realized that I have yet to confirm that I have convinced anyone of its function. Further deconstructing the disconnect, I'm not sure how many people have been convinced of the problem (a few, at least), and only that subset of people are eligible to understand the proposed solution in the first place. My current guess is that time is just needed to process it. This concept took me quite some digesting at first. The underlying equations can be as simple or as complicated as you like. A true freely rotating cylinder isn't nice to work with, and for the laminar solution it even has a paradox for it. Since my prior post which handled the issue was relatively general over all flow regimes, it was also less easy to understand. Here, I'll simplify things to show the scaling that will most likely be relevant. If you'll indulge only the most basic dimensional analysis intrinsic to almost all turbulent drag calculations, the motivation and operation behind the friction buffers becomes clear very quickly. Imagine a baseball flying through the air. Most physicists wouldn't hesitate to quickly categorize the force as being proportional to v^2. If you want to think in terms of units of power, it's a very quick step to say that (power) = (velocity) x (force). That means that power has a form of v^3 in the same way that we said that force has a form of v^2. With this, we can get a dependence on the number of sheets. The argument is accomplished here in its most simple form. Our equation for shear pressure (the retarding force per area on the cylinder) only involves the velocity out of all variables impacted by the number of sheets. Since the relevant channel velocity is divided by the number of stages, power ultimately goes with 1/N^2. Clearly, adding more layers of sheets will reduce friction. But why does this not involve the width of the channel? Because to a first approximation, the width of the channel doesn't matter, and that is hidden as a dependency of the friction factor "f". Of course this is a bad assumption. Intuitively the friction between two sheets moving parallel depends on the distance between them. The root of the prior formulation is that fluid velocity only increases logarithmically from the distance to the wall. Given high enough Reynold's number ln(x) is kind of a little bit flat-ish. Clearly this is unsatisfactory, so to remedy this we merely rewrite things with a form for the friction factor - which is where this dependency lies. This is commonly illustrated in the Moody Chart. Here I have reproduced that chart from the Colebrook-White equation. Many approximations exist for the friction factor, but we know almost exactly what regime we'll be in. I plotted those points for different numbers of sheets, along with an approximation for the reference tube design. We'll plug that approximation into the prior format. 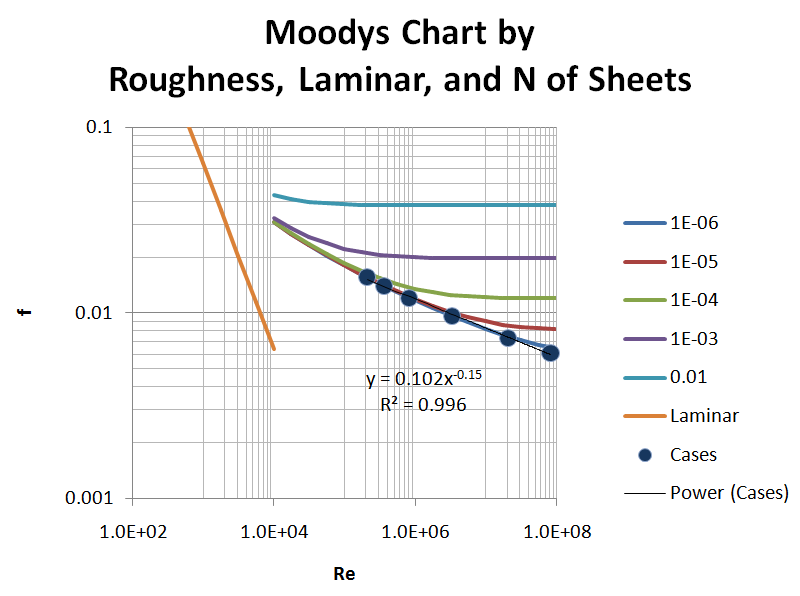 As a minor detail, Moody's chart has the roughness in it as well. This will penalize adding more sheets technically, but it doesn't matter in the end. The reason is because decreasing the channel width increases the size of the roughness to channel size. However, even if we have 20 sheets, that leaves something like 5 meters. The sheet itself should only be a few milometers in my view, so clearly the roughness can't be more than this. Comparing to the values displayed here that's off the chart. Might as well consider it smooth. With this specific approximation, we can plug back into the previous equation in order to have a very definite form for the shear stress. To go from this to power, multiply by the overall V. This involves a few steps and a little bit of math, but at the end we'll have a very useful form. Let me stress that this is an accurate representation of our situation as long as we're in the turbulent regime. What is this constant on the top though? That's the power you would have in the case of N=1 for a specific reference case. That still doesn't represent a rotating cylinder in a free atmosphere, because it utilizes a standard channel width of about 100 meters. I find it entirely arguable that you would have to install a flow arrester like this if you built any kind of in-atmosphere artificial gravity tube... because if you don't you'll have very high air currents to deal with. 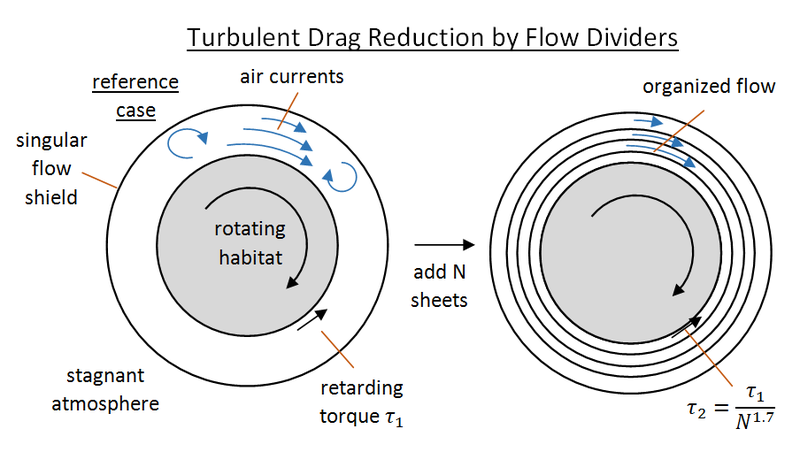 Using this flow arrester will increase drag somewhat from the scenario where you don't use it. Anyway, it forms a reference case that I need in order to make this math comprehensible. The economic case seems pretty clear. Even in Manhattan people average something like 30 square meters of land per person. In the reference case, that would amount to 15 kW per person, which would likely dominate energy consumption. This doesn't mean it's impossible. You could do this, but if you did, thermal and energetic constraints would be setting your engineering limits at just about every turn. Clearly you wouldn't go this route if a better alternative existed - and it does. The formula is quite simply to scale the number of flow divider sheets to achieve the necessary power level. One might also be confused by the calculation of power. Indeed, for the fluid dynamics calculations we used "v", lower case v, which is the half-velocity within a channel. But to get total power consumption, we multiply shear stress by "V", the total velocity shift over the entire friction buffer region. This is justified because the torque to keep the tube rotating is applied relative to the stationary reference frame, but it is dragged on by the fluid forces present in only one layer. But I don't expect everyone to believe that right away, so I'll show the other approach as well. Let the index _i mean that a quantity is for a single stage. To sum up power, we have to add a factor of 2 because these aerodynamic forces exist on both sides of the sheet. I don't think this is particularly profound, but perhaps it needed to be stated. The expression for "tau" uses 4 f in it. This is done in order to employ the Darcy friction factor. If you used the Fanning friction factor instead, you would just use "f". Reynolds number contains "d" for the width of the channel. We know there are N channels, however, the equation for shear stress doesn't apply directly to Couette flow, but instead a channel with one free end. This is mathematically the same as half of one of our channels, so the operative d would be D/2. However, hydraulic diameter in Reynold's number must be found by using 4Ax/Dx, where Ax and Dx are the flow area and diameter. This comes out to 2 times the width of the channel in question. Combining these two factors, we see that the linear dimension to be used in Reynold's number is D/N. Hey, good to see you posting again. I had a hiatus too. I've linked to your blog and the SF Ideas page on the Gravity Space Balloons.